The angel who talked with me had a measuring rod of gold to measure the city, its gates and its walls. The city was laid out like a square, as long as it was wide. He measured the city with the rod and found it to be 12,000 stadia in length, and as wide and high as it is long. The vision of John in Revelation 21 encourages us to let the wonder of God and his grace stretch our minds and hearts. It invites us, once again, to offer to our glorious God all that we are and all that we do this day. John’s vision of the heavenly city in Revelation 21 reminds me of New York in a way. When the angel who escorted John measured the city, he found that it was 12,000 stadia in length, width, and height. In case you’re not up on your ancient measurements, a stadion was one-eighth of a mile (or 192 meters). This means the city in John’s vision was 1,500 miles long, 1,500 miles wide, and 1,500 miles high. Its footprint would be about 60% of the size of the entire United States. 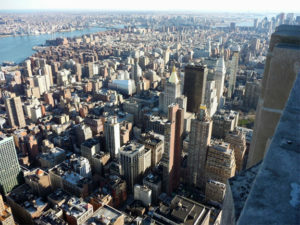 And its height would be 4,500 times higher than the tallest building in New York. Now that’s a big city! Why would the New Jerusalem be so gigantic? The most obvious answer is not hard to discern. It needs to be so large because it needs to accommodate so many people. When all is said and done, millions upon millions upon millions of people will join the family of God. Thus, as it says in Ephesians, “in the coming ages,” God will “show the incomparable riches of his grace, expressed in his kindness to us in Christ Jesus” (Eph 2:7). The abundant riches of God’s grace will fill the heavenly city with the vast family of his children. What difference does this make for you and me today, as we go about our daily work? I would suggest that the image of the giant heavenly city invites us to lift our eyes from our routine, to see beyond our cubicle, or even our corner office, and to envision the majesty of God and the enormity of his saving work. We can get so wrapped up in the little things of life, so focused on our own “stuff,” that we lose sight of the wonder of God’s work and the glory of the future he has prepared for us. The vision of John in Revelation 21 encourages us to let the wonder of God and his grace stretch our minds and hearts. It invites us, once again, to offer to our glorious God all that we are and all that we do this day. Can you think of a time in your life when you have been impressed by the size of a city? When was this and where? Put yourselves in John’s shoes. What are you thinking as the angel is measuring the city? What are you feeling? What helps you to remember the vastness of God’s grace? How might you work differently today in light of John’s vision? Gracious God, how easy it is for me to lose sight of your awesome power and marvelous grace. I can so readily focus on myself, my work, my space, neglecting to lift my eyes to your wider and glorious work. Thus, I thank you for John’s vision in Revelation 21. May the enormous scope of your future city expand my mind and heart today as I seek to serve you in all that I do. Amen.